If you think I’m gonna make a green bean casserole that isn’t bomb AF and worthy of being on my blog, you’ve got me f’d up. 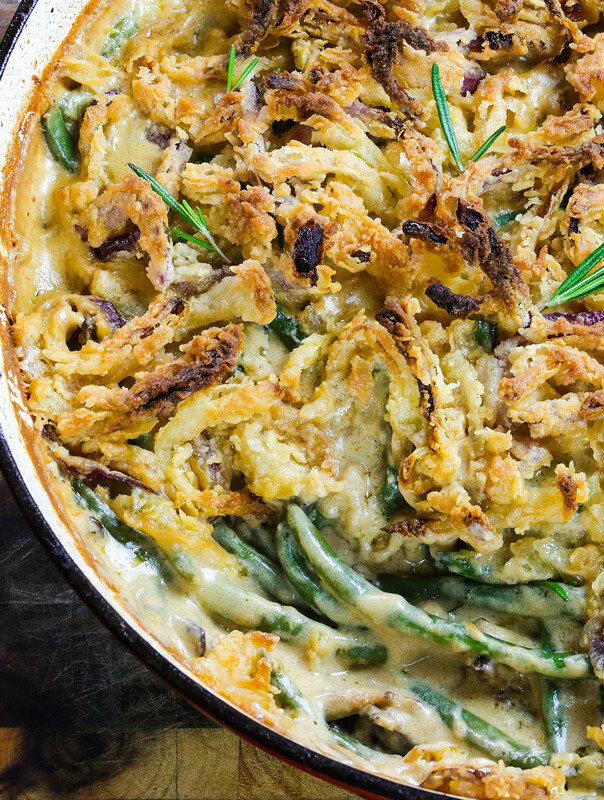 For years, I avoided any kind of green bean casserole because it’s notoriously made with canned soup. No shade, but yuck. Then I realized, “Wait a minute…this can be made from scratch, and can be slammin!” So here we are, guys. Facing the elephant in the room. Green bean casserole is no longer has to be stereotyped as the flavorless canned soup atrocity that Peggy from Accounting would bring to the office potluck. 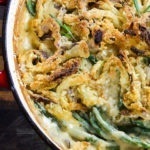 This is ultimate green bean casserole. No canned green beans. No canned soup. 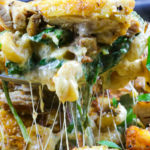 Just full on flavor, texture, bliss…and did I mention how easy this recipe is? 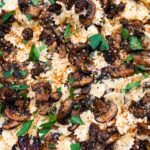 The mushrooms really balance out this whole dish with their delicious meatiness and umami punch. Leaving them out is an option, but not a very smart one. 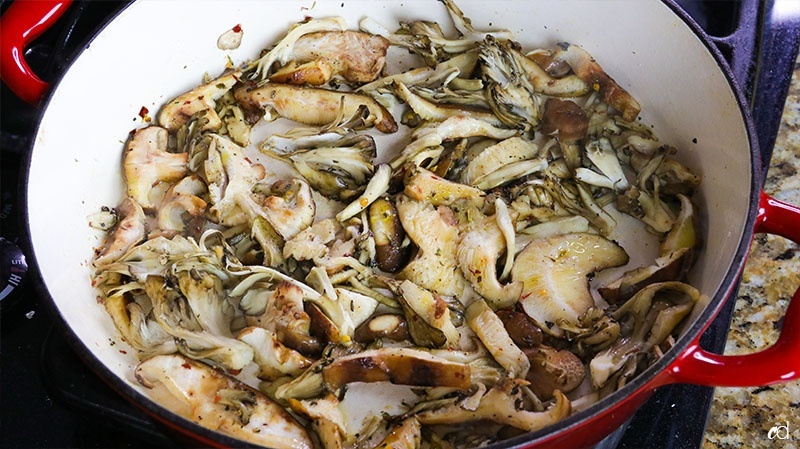 We’re using hen of the woods (maitakes) and shiitake mushrooms, though any variety will work. 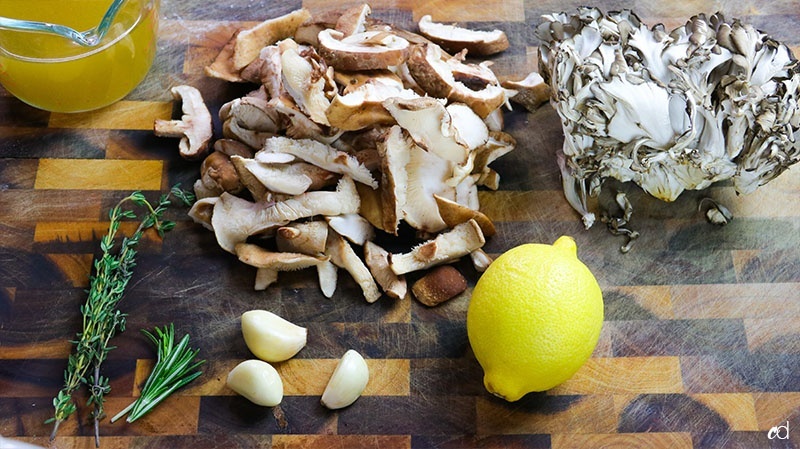 Try criminis or portobellos, beech, oyster, chanterelles, etc. Get creative. Another burst of flavor comes from the fresh garlic, balsamic vinegar, fresh thyme and rosemary, all topped with sweet crispy onions. Feel free to fry up any onion you choose. I used yellow and red onion, because that’s what I had on hand. You’re not gonna believe how delicious this is. When you make it, you’re gonna pat yourself on the back and rush to share it with your friends and family. I don’t blame you, I did the same thing. It’s seriously so damn good. I’m using a mix of yellow and red onion, because that’s what I have on hand. But use whatever you want. Put it in a ziploc bag to make things easier. Push all the air out, as much as you can, and let it marinate for up to an hour. 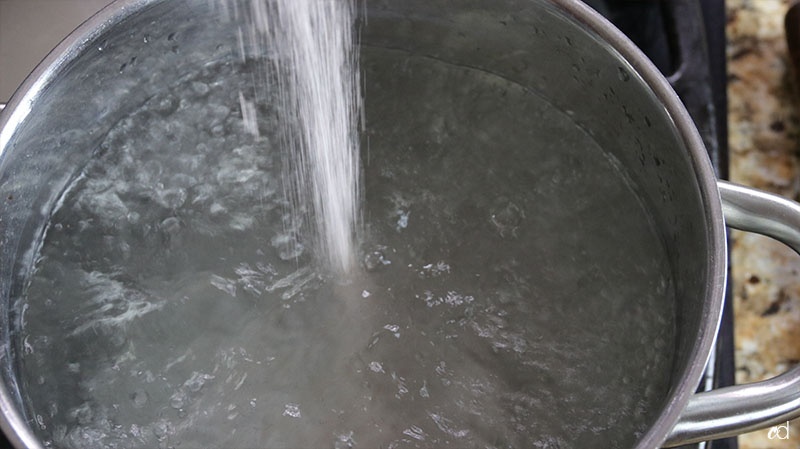 Add salt to boiling water. Immediately shock them in super cold water to stop the cooking process. Mix some self rising flour with sea salt. This is what we’ll bread our onions with. 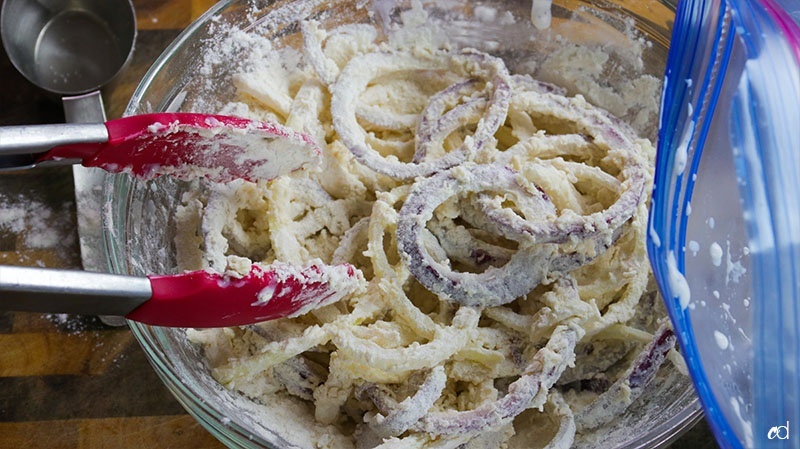 Toss the buttermilk onions in the flour mix til they look like this. Make sure they’re all evenly coated. Meanwhile, heat your oil to 375 F.
Fry them for about 3 minutes. They’ll be kinda pale, and that’s what you want! They’re gonna get darker in the oven later. 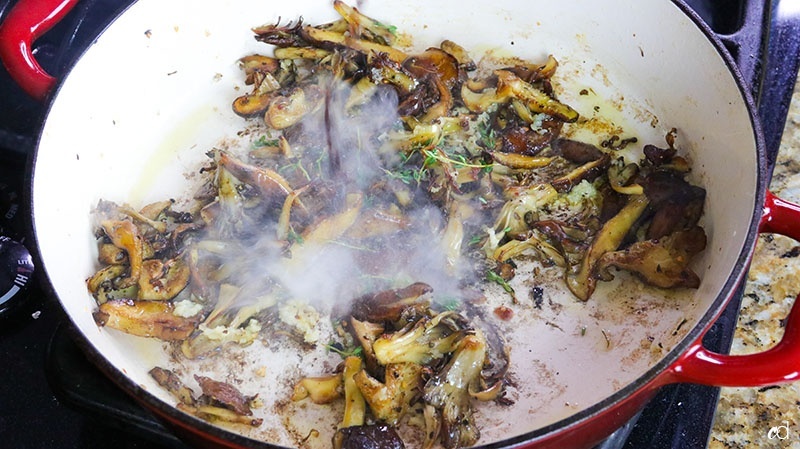 I’m using shiitake and maitake mushrooms for my casserole. 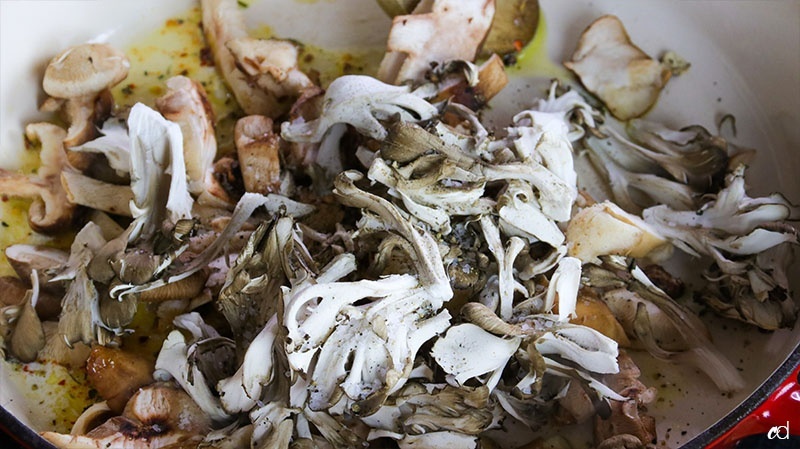 You are free to use whatever blend of mushrooms you prefer. 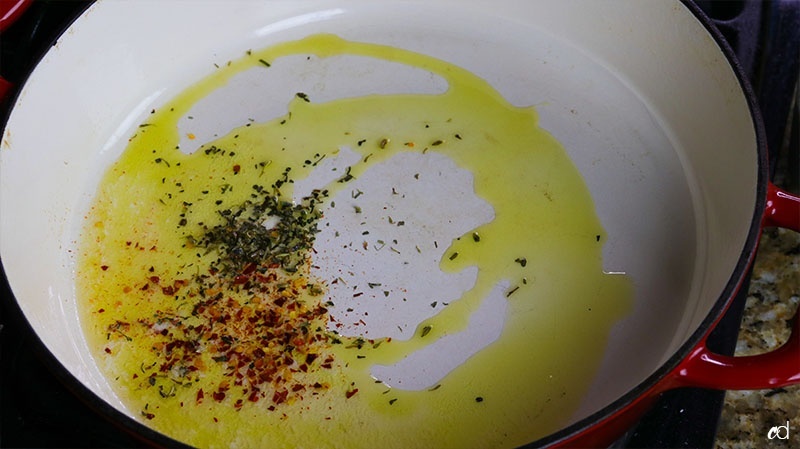 Melt the butter down with some olive oil, add some crushed red pepper and herbs de provence. 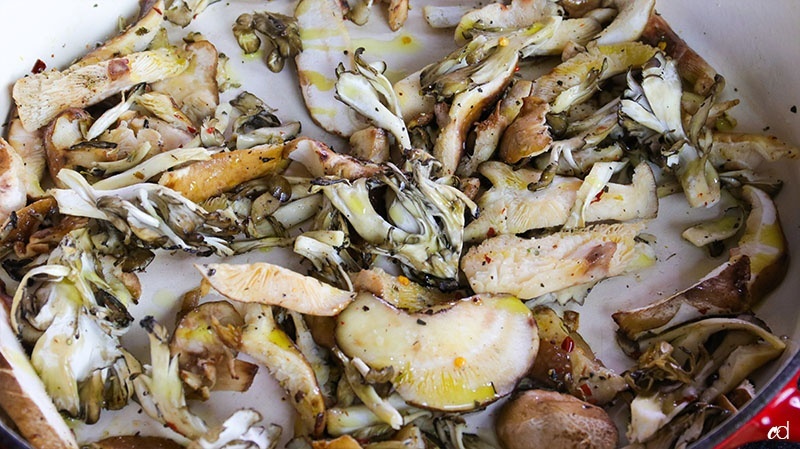 Add the mushrooms with a healthy dose of salt and pepper. Toss them around to make sure they’ll nice and lubricated. Shouldn’t be swimming in oil, but shouldn’t be dry either. Lay them in a single layer. Leave them alone for a good 3 to 4 minutes. Flip them over and let them caramelize all over. Leave them alone for another 2 to 3 minutes. Once they’re nicely browned, add the garlic. Cook that for a good 30 seconds. Add the fresh thyme and rosemary. Pour in the balsamic vinegar and worcestershire. Scrape up any bits. Dump in the flour, toss everything with it. Add the stock, scraping all the bits up. 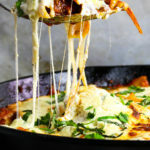 Don’t forget the cheese. Taste it. Adjust seasoning as needed. Even them out as much as you can. 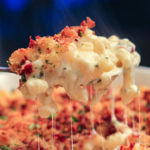 Pop it in the oven for 25 minutes. Stick with me and your Thanksgiving will be lit AF. Super tasty and very satisfying. 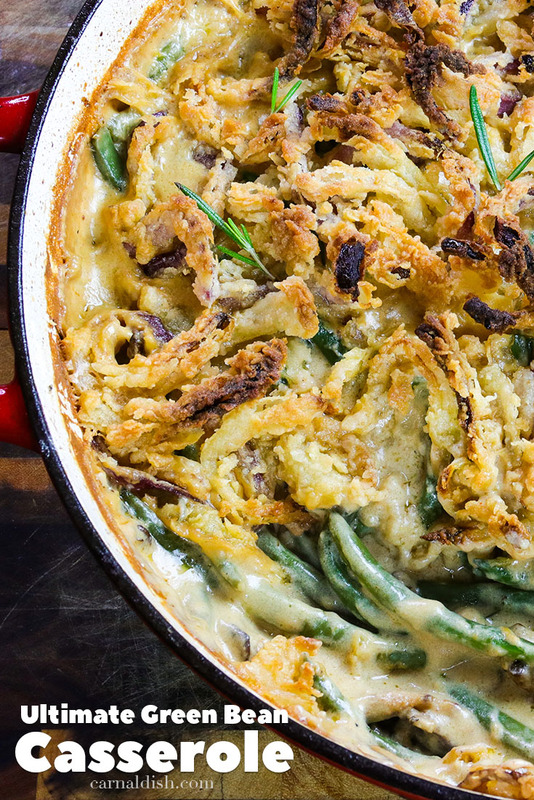 This is the ultimate green bean casserole, y’all. It’s SO good. Sometimes during the holidays, you may want to make things in advance to reduce kitchen stress. Or, you may be traveling with said dish. Here are some ways to help you with that process. 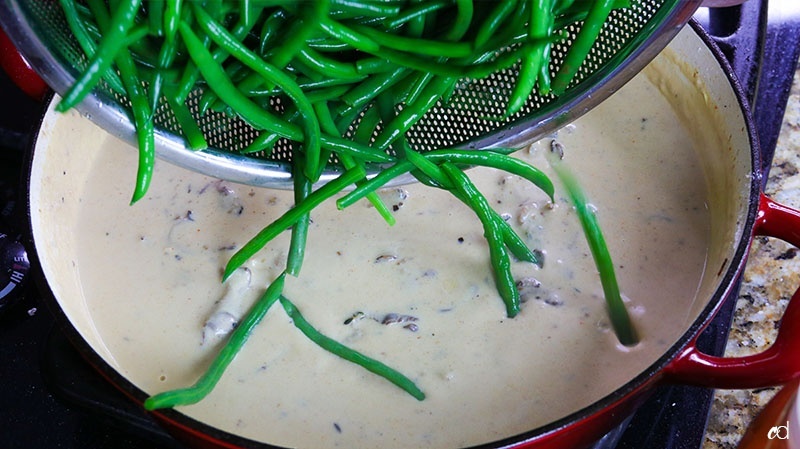 1 day ahead: prepare the mushroom gravy and blanched green beans separately. 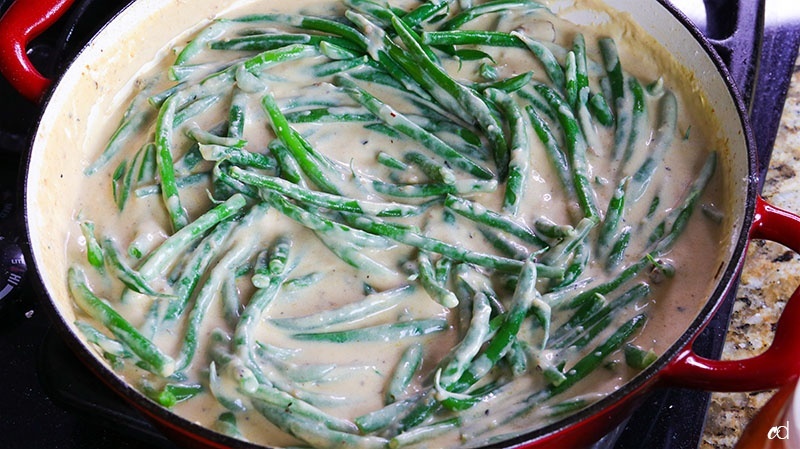 Pack the room temperature gravy in a large plastic zip bag or heavy duty plastic container, same with the green beans. Fry the onions, let them cool completely before packing away in a separate plastic zip bag. On the day of, take everything out of the fridge at least an hour before you’re ready to cook. 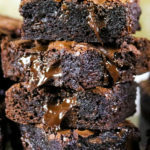 Allowing it to come to room temperature will help it bake more evenly. 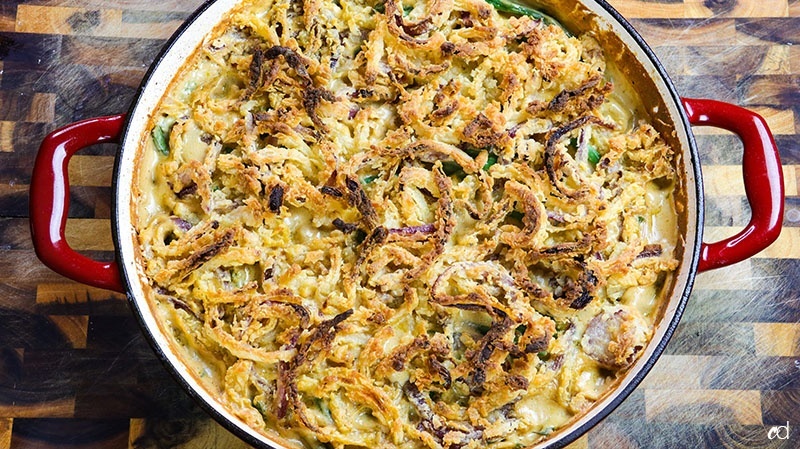 Simply combine the gravy and green beans in a baking dish and top with the onions. If you need to add a tiny bit more moisture, please do so with a few splashes of either water or chicken stock. Bake in a preheated 400 degree oven for about 30-35 minutes, or until bubbly and the onions have crisped and browned even more. 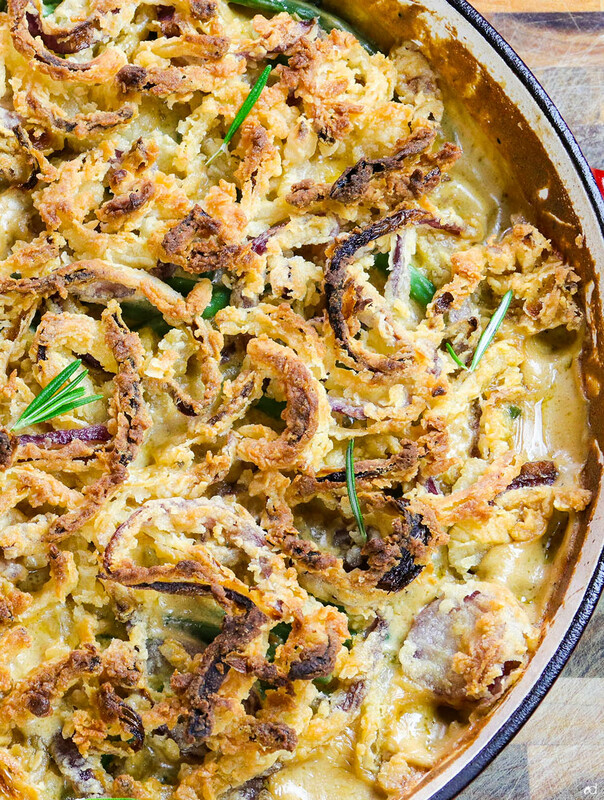 Traveling the day of: bake the casserole as instructed, but without the fried onions. 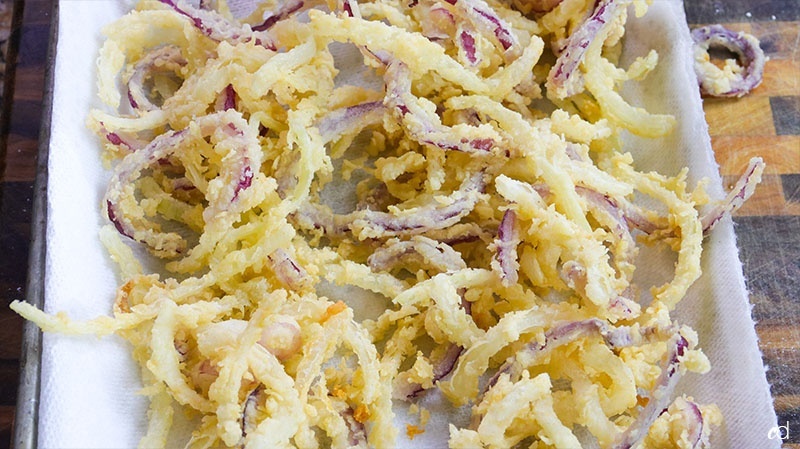 Bake the fried onions separately until they’re a deeper golden brown, then assemble once you’re at your destination. 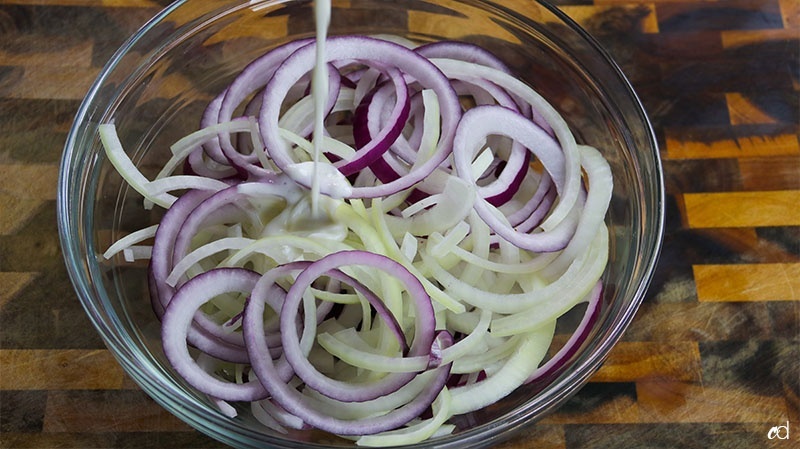 The best way to do this is to allow the onions to cool completely before you pack them up, this way they don’t steam in a container or plastic bag and become soggy. 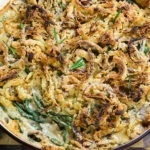 Quite frankly the best green bean casserole you’ll ever make from scratch. 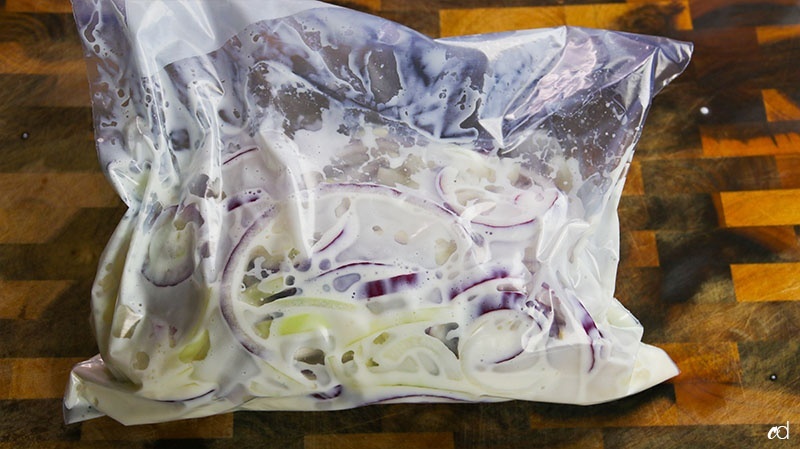 To make things easier for cleanup, place the sliced onions in a large gallon plastic zipper bag. Pour in the buttermilk, and toss the onions around to make sure they’re nice and coated. Press as much air out of the bag as you can, and zip it up. Let the onions soak for about a half hour, up to an hour. Meanwhile, make the dredge by combining the self-rising flour and sea salt in a medium bowl. 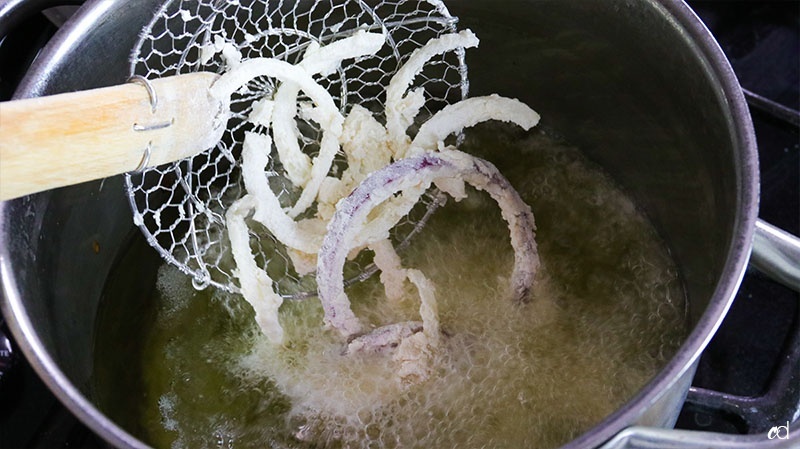 When you’re ready to fry, pour about 2 inches of oil in the bottom of a tall-sided pot. 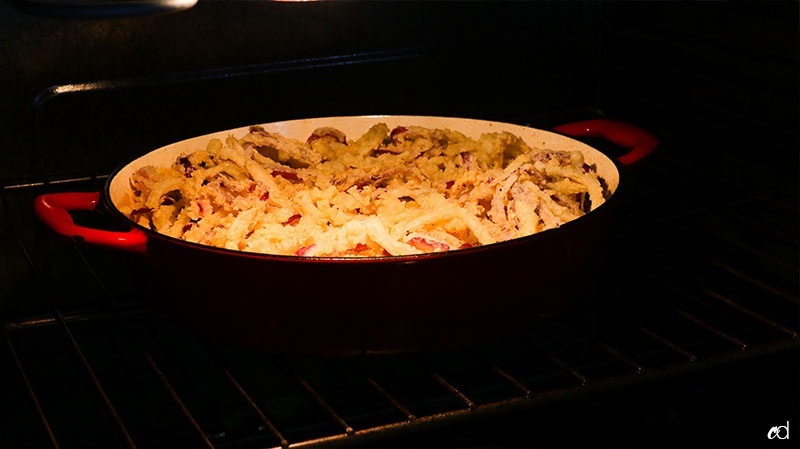 Make sure you use a pot with high sides because the oil will rise as the onions fry. Heat the oil to 375 degrees F.
Dredge the buttermilk soaked onions in the flour mixture until they’re all evenly coated, shaking off any excess. 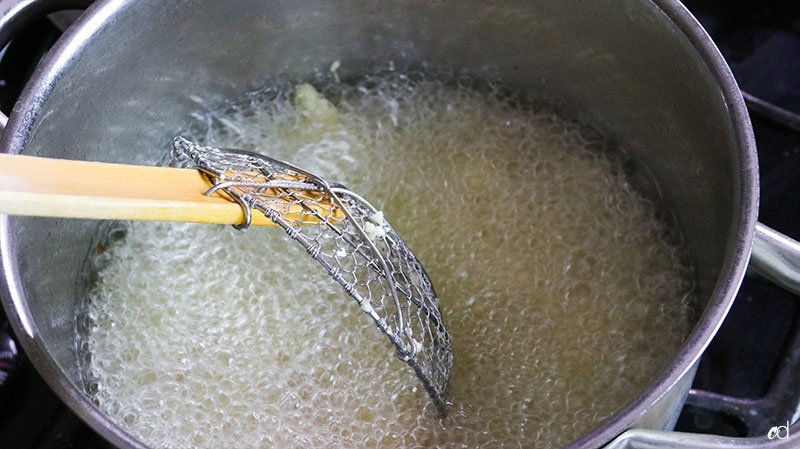 When the oil is ready, fry your onions in batches for about 3 minutes, then drain on paper towels. They will be very blond looking at first, but don’t worry, they’ll brown up in the oven later. 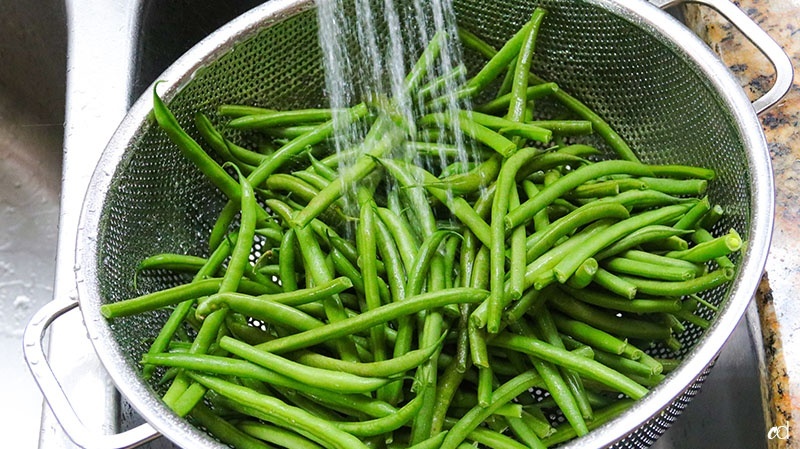 Wash your green beans thoroughly with cold water. 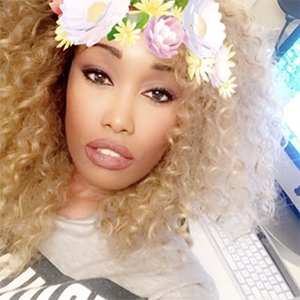 Chop or snap off any stringy/woody ends. Bring a large pot of water to boil. Add 1 tablespoon of fine sea salt to the boiling water. 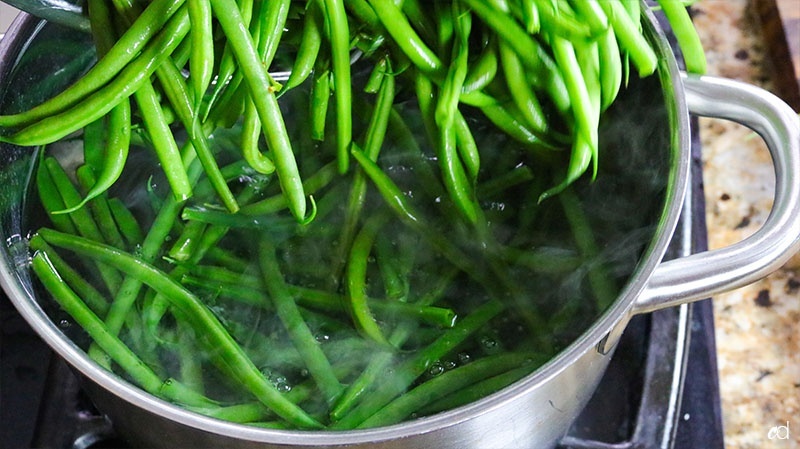 Add the green beans, and blanch them for exactly 4 minutes. Drain and cover with ice cold water to stop them from cooking. Set aside. 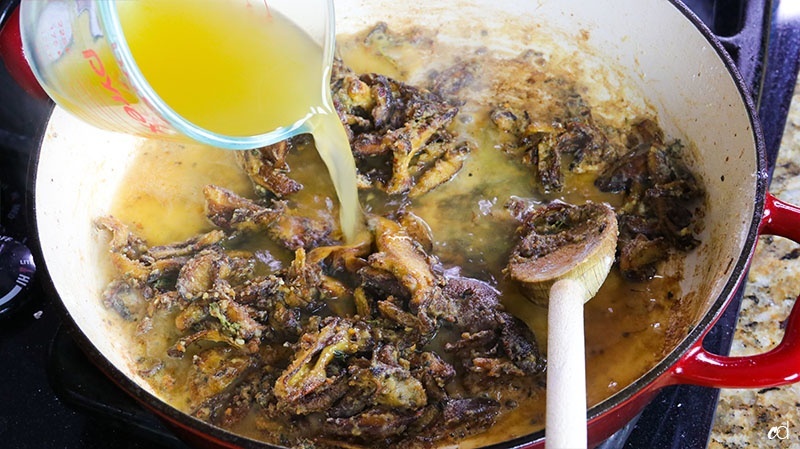 In a large skillet or braising pan, heat 2 tablespoons of butter and 2 tablespoons of olive oil over medium heat. 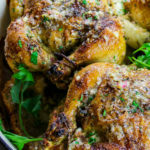 Sprinkle in the crushed red pepper flakes and herbs de provence. 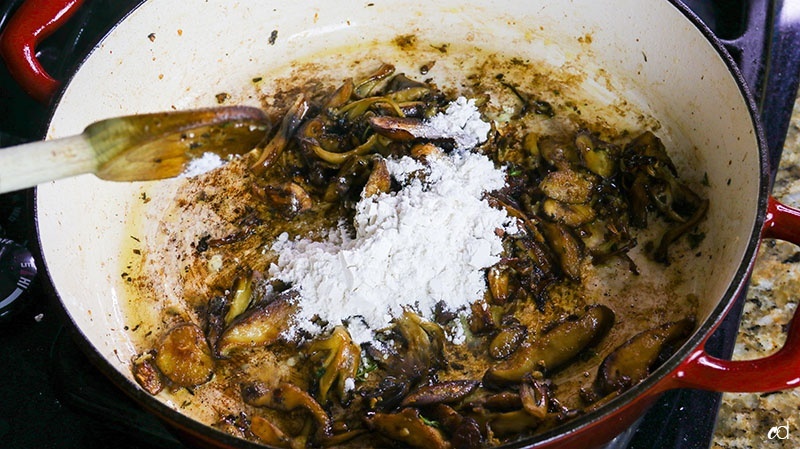 When the butter and oil start to bubble and foam up, add the mushrooms. Give them a generous pinch of kosher salt and black pepper, then arrange them into an even layer across the bottom of the pan. 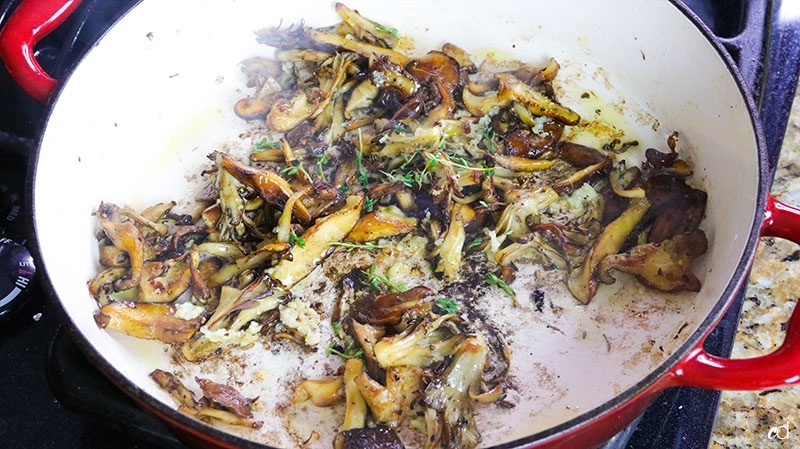 You want to make sure each mushroom has some kind of contact with the pan so it can caramelize. First, they will release water, then start to caramelize. Once they’re in an even layer, leave them alone for about 3 to 4 minutes. 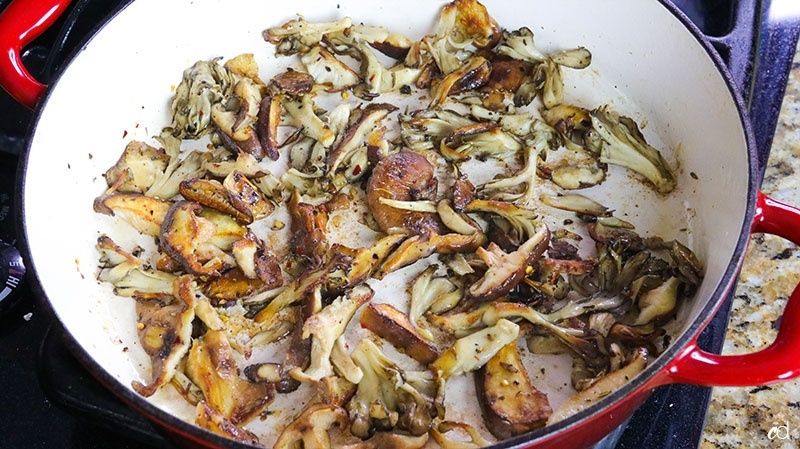 Toss them around so they’re flipped over, arrange in flat layer, and leave them alone again to caramelize. Do this until they’re evenly caramelized all over, this will take a total of 8 to 10 minutes. Add the minced garlic, and gently stir to cook for about 30 seconds. Add the fresh thyme and rosemary, and cook for 10 seconds while constantly stirring. 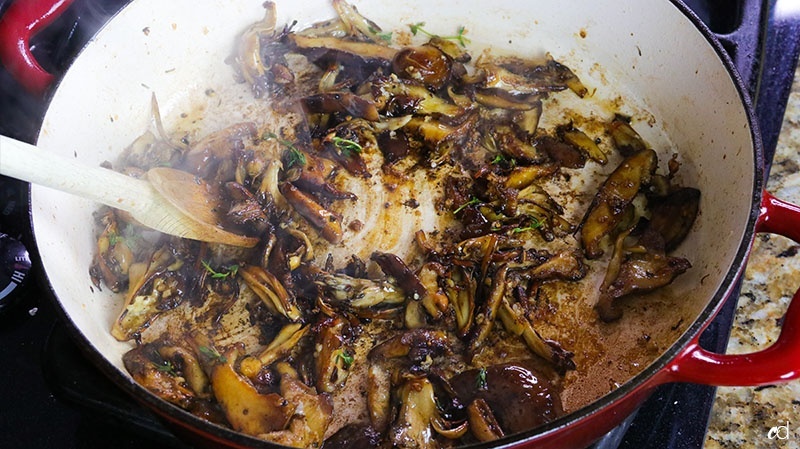 Pour in the balsamic vinegar and worcestershire sauce, while scraping up any brown bits on the bottom of the pan. Most of this liquid will evaporate almost immediately, so drizzle in just a little more olive oil if needed. 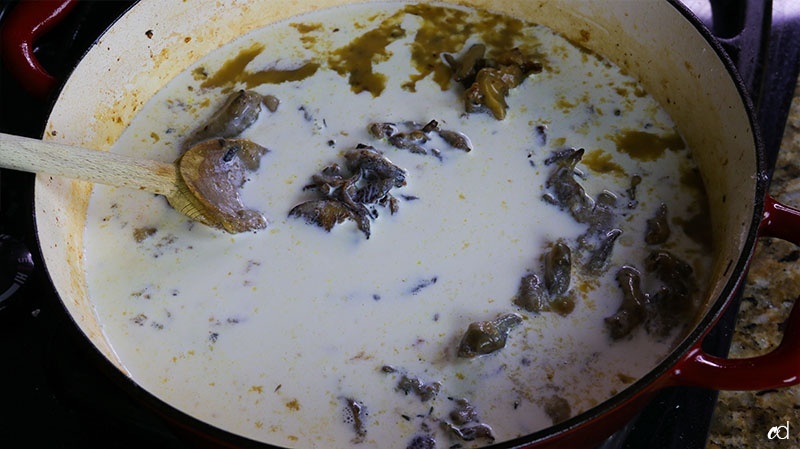 Dump in the flour and toss with the mushroom mixture until every mushroom is coated. Cook for 1 minute. No white streaks of flour should remain. 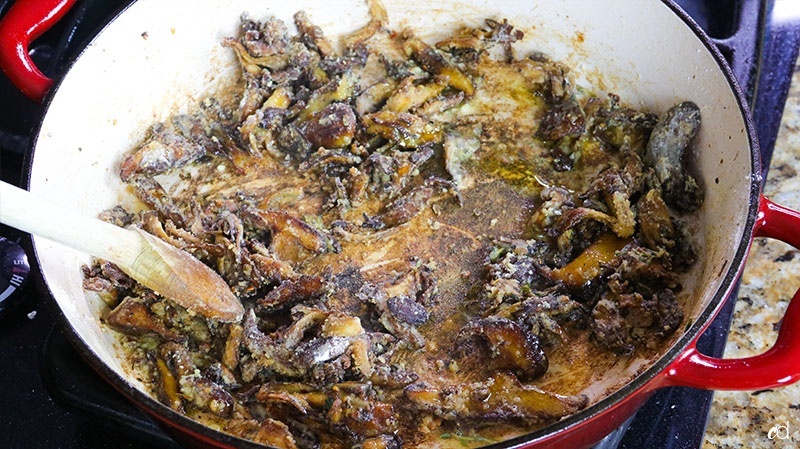 Pour in the chicken stock, while scraping up any bits on the bottom of the pan. Adjust the heat if necessary, reducing it to medium-low. Immediately pour in the half and half, stirring constantly to avoid any lumps. 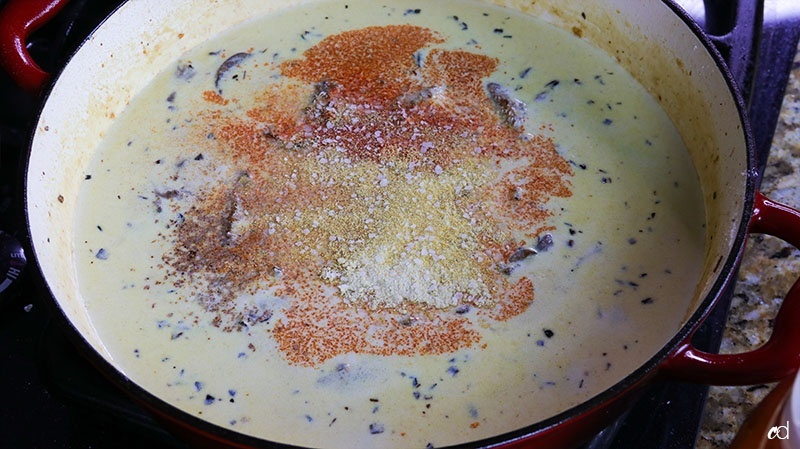 Season this mixture with dried mushroom powder (if using), kosher salt, black pepper, cayenne, nutmeg, onion powder, garlic powder, and smoked paprika. Taste it, and adjust seasoning as needed. 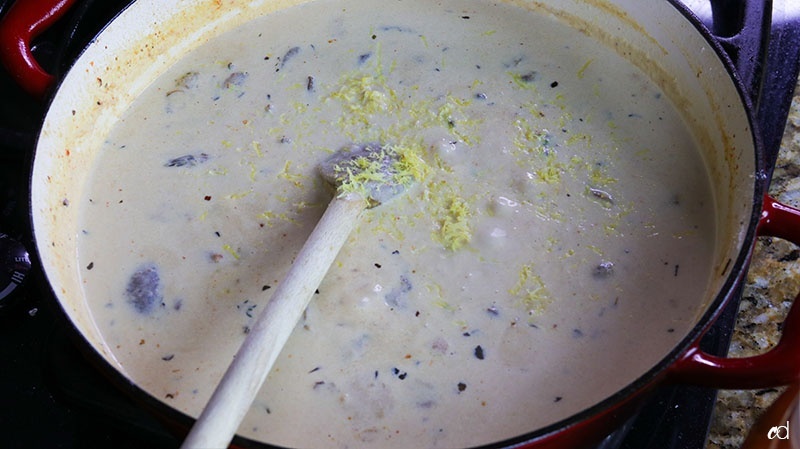 Allow this mixture to come to a simmer and thicken, about 3 to 5 minutes. 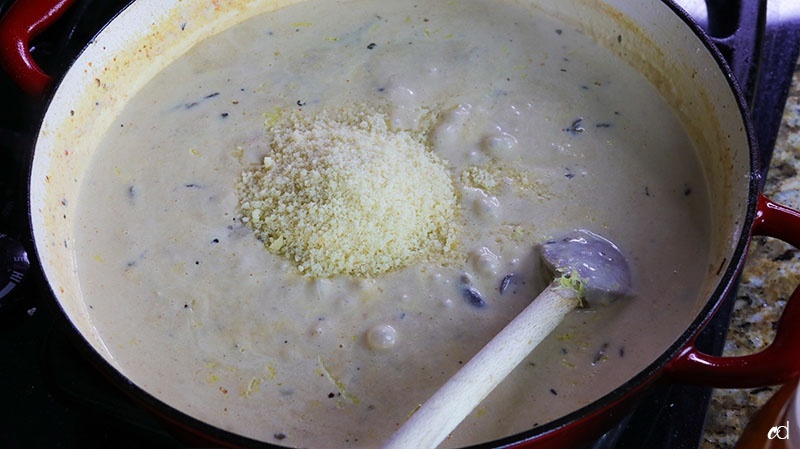 When the mixture is gravy-thick, add the zest of one lemon, and the parmigiano reggiano cheese. Turn off the heat, and adjust seasoning again if needed. 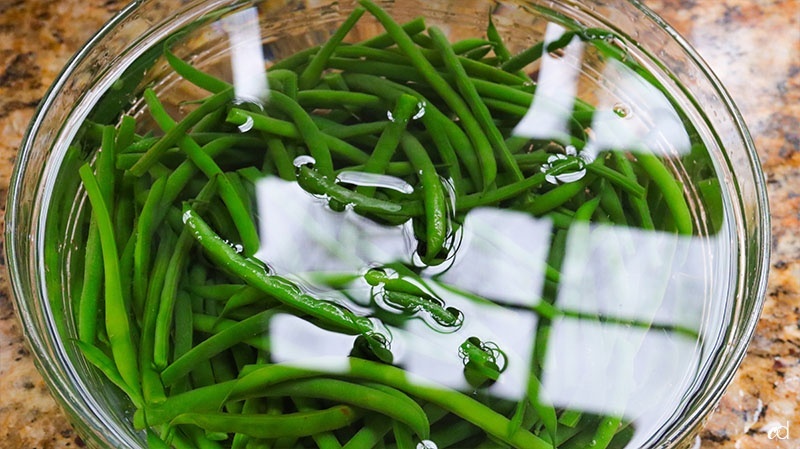 Carefully add the blanched green beans, arranging them in an even layer. 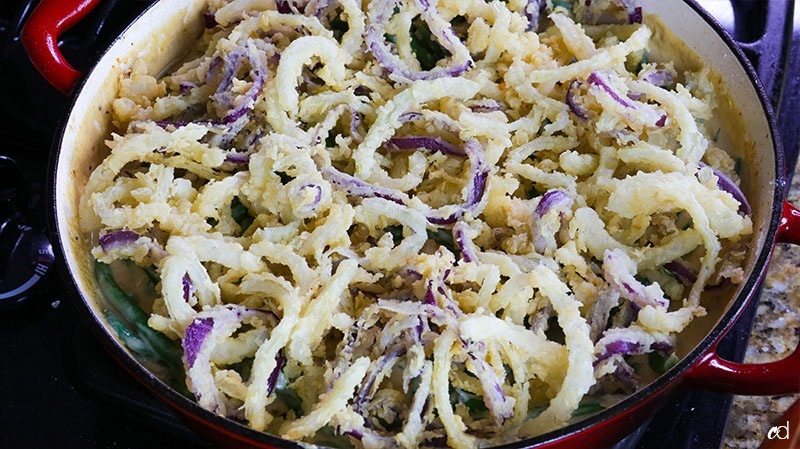 Top with an even layer of the fried onions and place in a preheated oven for 25 minutes on the middle rack. 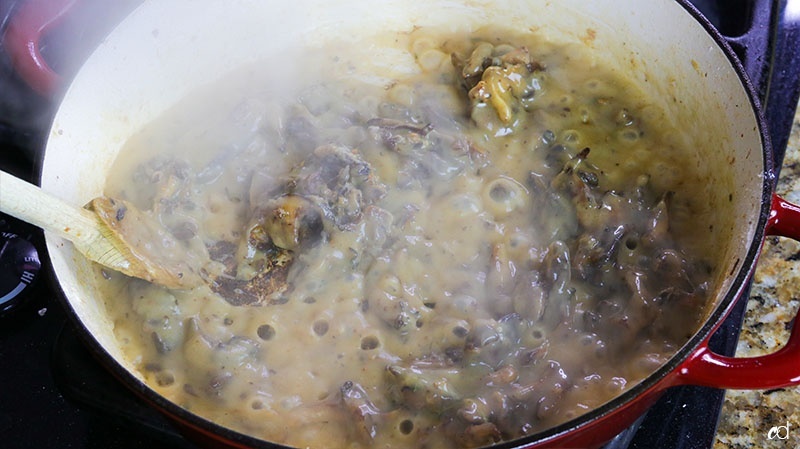 It’s done when the onions have browned even more and the mixture is nice and bubbly. Let it rest for 10 minutes before serving, it’s molten hot, and damn good. 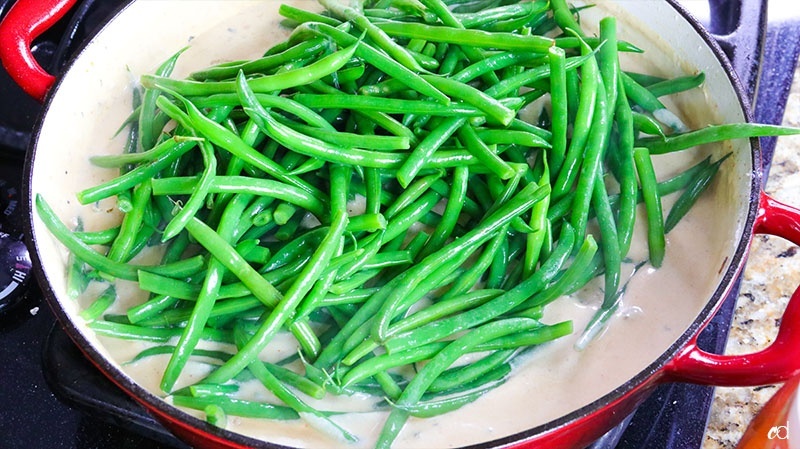 I used French green beans, called haricot verts. 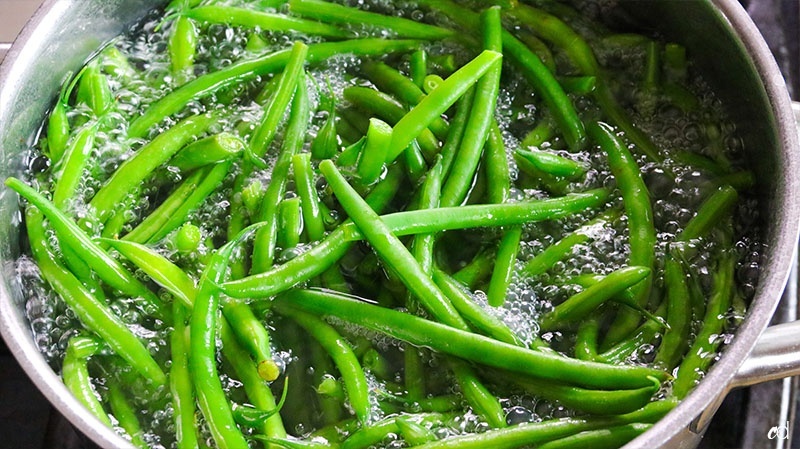 You can absolutely use regular green beans for this recipe. 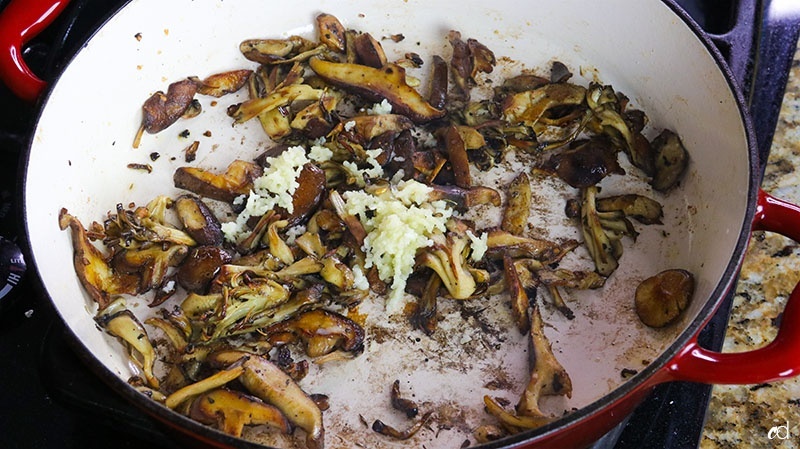 Feel fee to use any variety of mushrooms for this recipe that totals about 10 ounces. 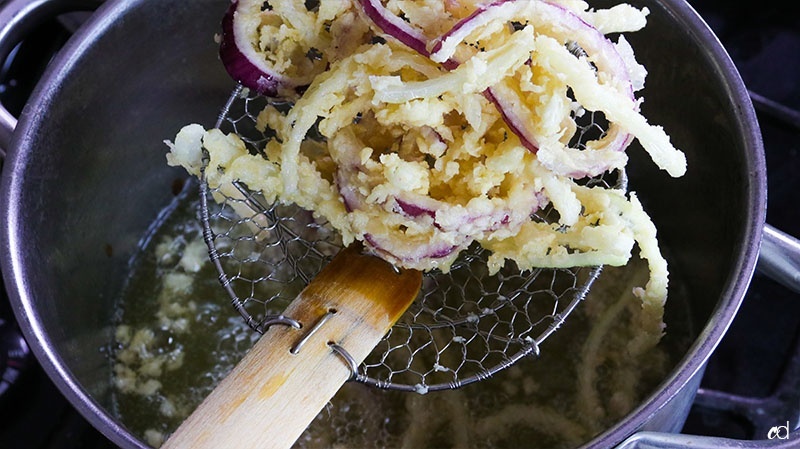 You can use any kind of onion here, or even shallots. 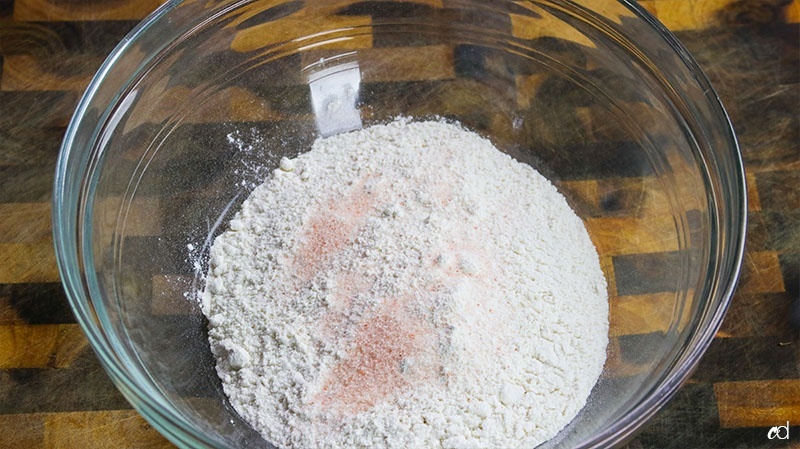 If you don’t have self-rising flour, simply add 1 tablespoon of baking powder to 1 1/2 cups regular all purpose flour.